One particularly admirable aspect of Amy Poehler’s sterling career is her involvement with Amy Poehler’s Smart Girls, an organization and website she founded with Emmy-winning television producer Meredith Walker with the goal of “helping young people cultivate their authentic selves.” Toward that end, Smart Girls has been producing “funny first and informative second” content aimed primarily at young women. One project which may be of particular interest to comedy fans is She Said, a new talk-show-style offering hosted by a real-life engaged couple: side-mulleted comedian (and A.V. 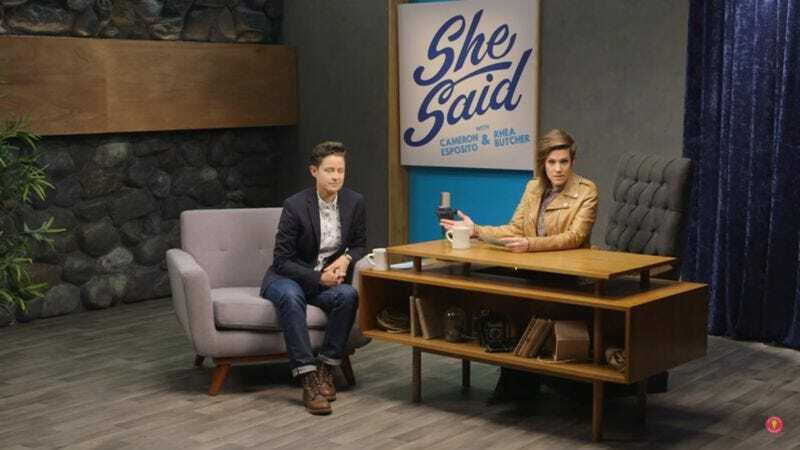 Club contributor) Cameron Esposito and her fiancee, Rhea Butcher, also a comic. In her introduction to the premiere, Esposito merely describes She Said as “a space where women talk about stuff,” a premise vague enough to provide plenty of potential directions for the series. While the first episode is devoted to a “body-positive dialogue about women’s health,” including an earnest discussion of first periods and pap smears, future She Said episodes will take on such topics as female representation in the media, coming out, the importance of feminism, and women in sports. The tone of the show, thus far, is friendly and casual, light but not too jokey. Esposito is exactly the right woman for the job, since she is already quite comfortable in a talk show setting and is able to take the episode’s topic seriously without becoming professorial or overly serious. Her enthusiasm and ebullience contrast amusingly with Butcher’s more reserved, deadpan approach. The best moment in the first episode arrives when Butcher tells an anecdote about being overly prepared for her first period, and Esposito uses that as a launching point for an adorably terrible math joke, complete with rimshot.